A Halifax County native, William “Bill” Tuck served as the 55th Governor of the Commonwealth of Virginia. To honor this local treasure, the museum proudly displays an exhibit featuring a number of Tuck’s personal artifacts, including the bible on which he took his inaugural oath and his famous top hat. With a replicated version of the governor’s office and a collection of newspaper comics caricaturizing Tuck’s vibrant personality, the William M. Tuck Exhibit is a must see for political and historical enthusiasts alike. In the late 1960s, a group of regional natives embarked tenaciously on the arduous task of excavating Oak Hill Island, one of the submerged land masses within Halifax County’s portion of Kerr Lake. During four seasons of exceptionally low water-levels, the group unearthed thousands of Native American artifacts ranging from spearheads and pottery to copper tools and glass bead jewelry. Provided to the museum by John H. Wells, one of the leading volunteers who participated in the excavation, a significant portion of the dig’s find is permanently housed here at the museum in South Boston, Virginia for all to see and enjoy. Since the American Revolution, sons and daughters of Virginia have been associated with virtually every foreign and domestic conflict in which the United States has been involved. To commemorate the dutiful bravery of those who served, the museum has on display an impressive collection of war-time artifacts and memorabilia. See an authentic WWII-era service Jeep. View service medals and commission orders. See the actual uniforms worn by local heroes. Whether one’s interest-level is passionate or passive, the War Room Exhibit is a stunning exhibit that yields both perspective and awe. Long before supermarkets and strip malls, the country store was the go-to place for acquiring necessary goods and supplies. Sprinkled around Halifax County are the remnants of these often family-owned establishments, and several still operate to this very day. The country store was a vital aspect of rural life, and the museum memorializes its presence in our heritage with a replicated store stocked with many of the era’s common products and fixtures. Before medical attention was only a three-digit phone call away, sole-practicing doctors served as the means for saving and sustaining life in rural Virginia. Since the mid-1700s, scores of physicians have served the people of Halifax County. Our exhibit honors their work and service by displaying artifacts and other items which demonstrate the history and the nature of pioneer medicine. One of the newest additions to the museum, the Map Room features a large, interactive map of Halifax County, Virginia. With the push of a button, one can find the location of his or her town and even trace the route of all of Halifax County’s rivers. Surrounding the map are walls of history, displaying evidence of the early English settlements of Virginia and the succeeding history. The Norfolk and Western train caboose number 518563 was originally manufactured by the International Railway Car Company at Kenton Ohio for the Norfolk and Western Rail Road and commissioned for service in 1970. The newly manufactured caboose was equipped with such amenities as three bunks, a propane refrigerator, axel driven generator, electric cabin heaters and much more. This caboose was a state of the art piece of railroad equipment. In 1988, the Town of South Boston was gifted the caboose by the N&W Rail Company after the rail line was permanently closed. Town officials began to look for a permanent home for their newly acquired rail car, but none were readily available. 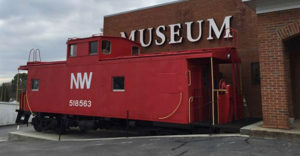 After several appeals were made by representatives of the South Boston-Halifax County Museum of Fine Arts and History, the caboose found its forever home. On June 11, 2007, a resolution was signed between the Town of South Boston and the South Boston-Halifax County Museum of Fine Arts and History transferring ownership of caboose number 518563 to the museum for exhibition. When the museum took possession, of the caboose, it needed exterior and interior painting. Most of the furnishings were previously removed with only the conductors chair and desk remaining. A significant amount of restorative work was needed in order to bring the caboose back to its former glory. The exterior and interior paint was completed in 2008. In 2012, President of the Board of Directors Paul Smith made a recommendation to add an HO scale model railroad and open the interior of the caboose to the general public. The renovation would include an HO scale model railroad depicting the first railroad to come through Halifax County in 1858 and exhibit some of the RR artifacts and photographs of the early railroads locomotives from the Richmond to Danville RR. The museum’s Board of Directors approved the project and work started in February of 2013. Thanks to several volunteers and generous donations from the local communitty, the project was completed in June of 2017. The HO scale RR features two steam locomotive models; one from the 1860’s and one from the 1900’s with state of the art DCC control system. The landscaping includes a scene from the Battle of Staunton River, 1850 to 1900 housing and buildings with interior lighting. Of course the layout would not be complete without a miniature tobacco field.